A Christmas bridal shower and wedding presents an opportunity to include the flavor of the holiday season without overdosing on it. With this shower, held in the evening, I made a valiant pass at it using some tried-and-true techniques and design elements. A flowing white cotton full-length linen is the start of an elegant table. 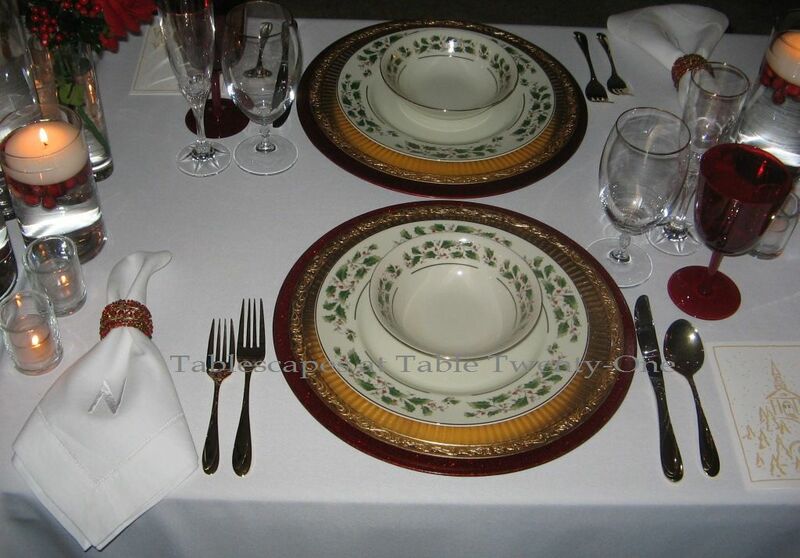 The red chargers I have relied upon this season were a great start to a stylish place setting. The red charger (Target) is topped with a decorative gold one from Old Time Pottery. (Click HERE or HERE to see this same technique used with different dishes and silver chargers.) No-name dishes I bought in the early 90s at a discount department store are still a treasure to me today with their traditional holly design. I just love it when things work out. I went with our linen napkins bearing the first initial of our last name that coincidentally (again, thank you, Lord!) is the initial of the last name the bride will take as her own this weekend. The colorful beaded napkin rings were a steal last year at Old Time Pottery for just 99¢ each! 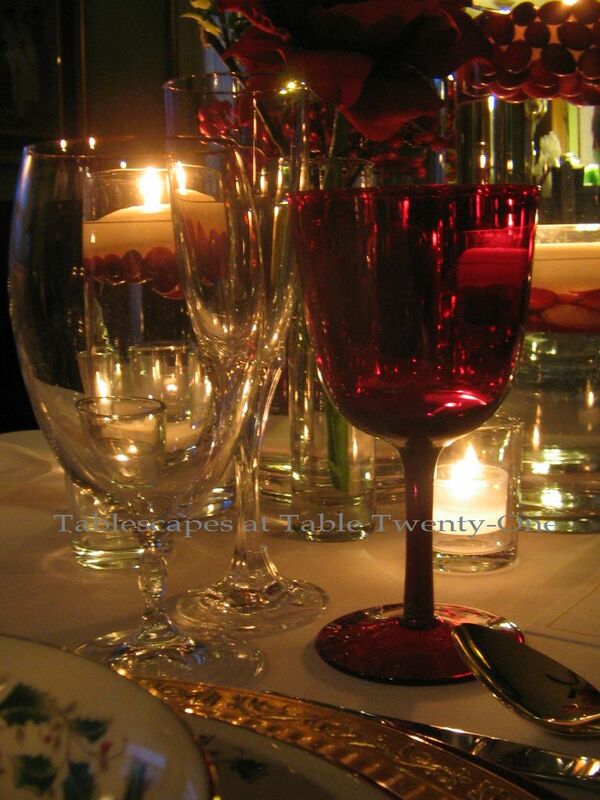 A mix of gold-rimmed clear (Tuesday Morning) and cherry red stemware (Pier 1) is illuminated by the glow of abundant candlelight. 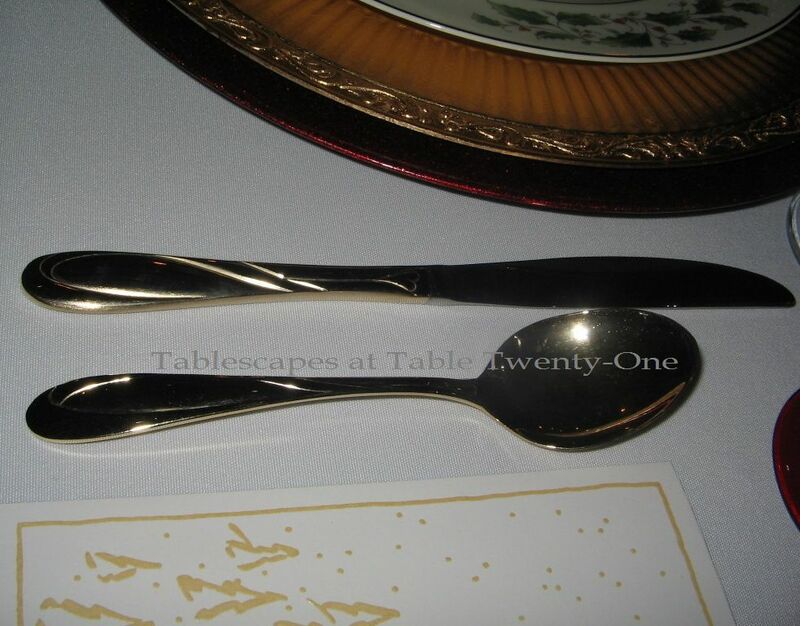 My old standby goldtone flatware worked well to round out the place setting. Stock Christmas cards create a menu with the theme of the evening, “Get Me to the Church On Time!” I used this same technique last year HERE for our Christmas season kickoff dinner. One more “thank you, Lord!” in that I was able to reuse the cranberries used HERE. I created a similar version of this centerpiece made up of various sizes of cylinders parading down the table with vibrant orchids for a beautiful summer engagement party. Click HERE and scroll down to “Love and Orchids” to see that table. 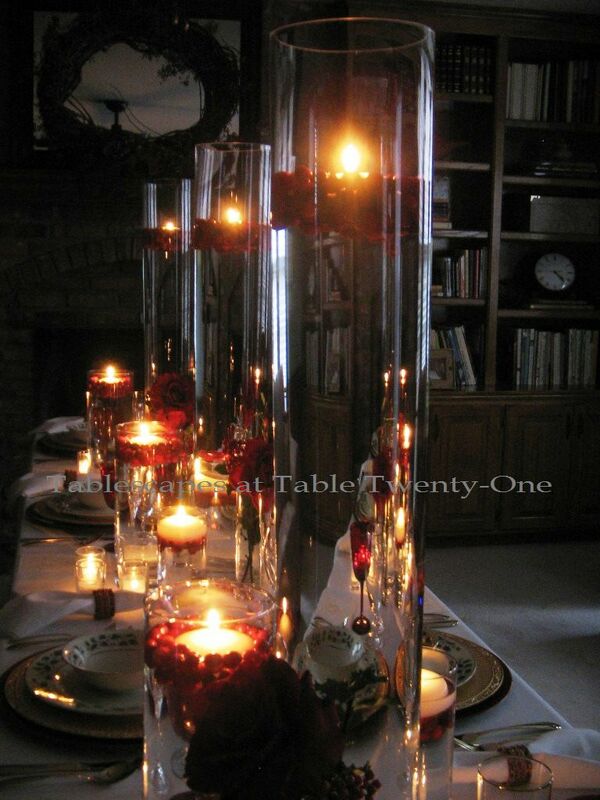 Floating cranberries and candles in the cylinders provides multi-level color and ambient light. Full-blown roses with sprigs of bright red berries and holly finish the look. That’s it! I’m sure the wedding will go off without a hitch, and this will be a Christmas to remember! 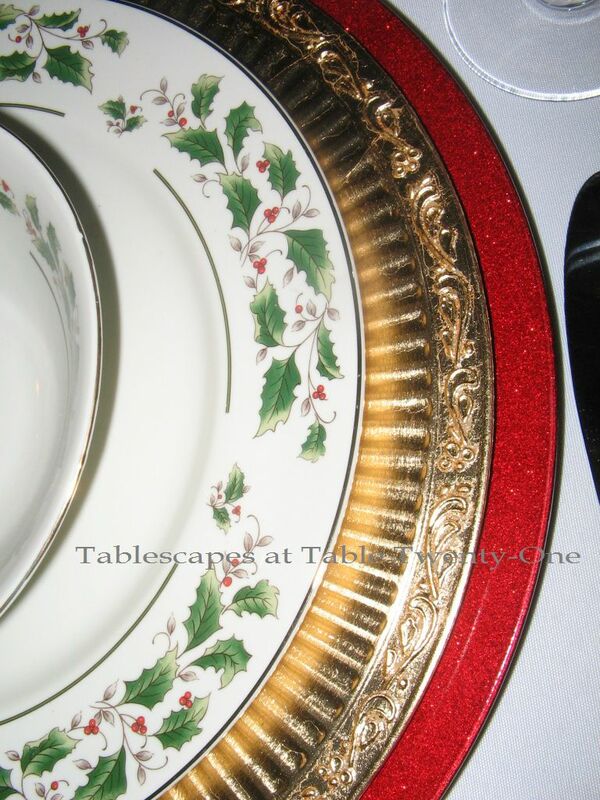 Please take a little break from all the hustle & bustle of the season to join the party at Susan’s Tablescape Thursday again this week. There’s so much incredible tablescaping talent out there! Photographer/Best Friend Sheri & me! My supportive, loving parents & me! ← The Art of Tablescaping Goes Live! 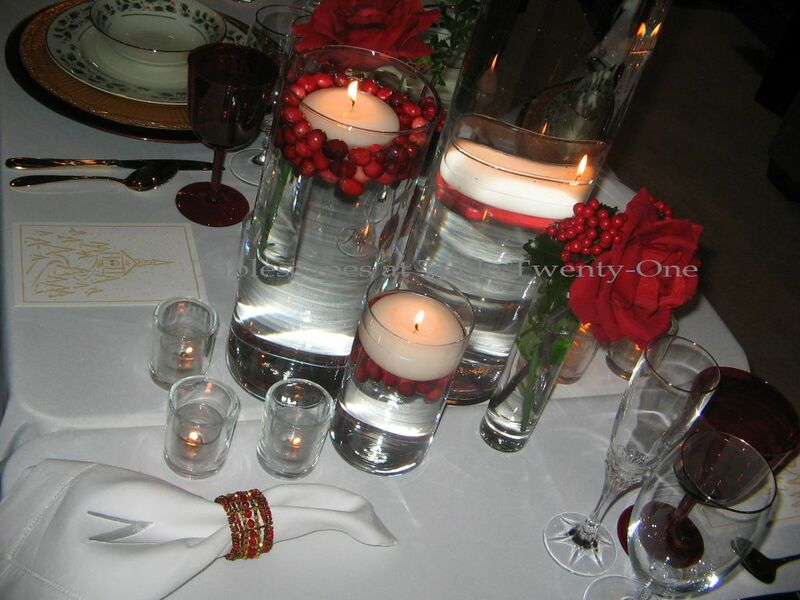 Oh I love those short and tall glass cylinders with the cranberries and floating candles! You get a 2nd reflection from the shorter one off of the taller one! I need to learn to try that! Your holly dishes are classic and obviously a good investment! I didn’t know chargers came in different sizes. I like the layering you created! Lucky you on the monogrammed napkins! That’s one thing I don’t own! I didn’t know you did a bridal shower! Love the pics of you, Ramon, your friend and parents! LOL I just realized I posted from my other blog! I enjoyed the Christmas card and the family photos, too! A Christmas wedding shower!!! How fun! Your table is gorgeous! I love decorating with cranberries at Christmas. They are so pretty with the white candles. Merry Christmas Alicia! 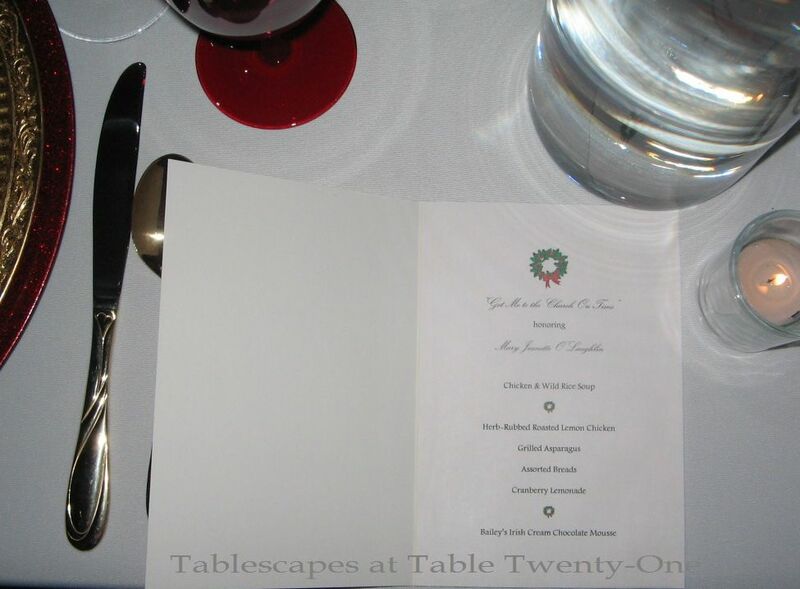 Christmas elegance for a wedding. So appropriate and beautiful! This table is just gorgeous!! I love it. 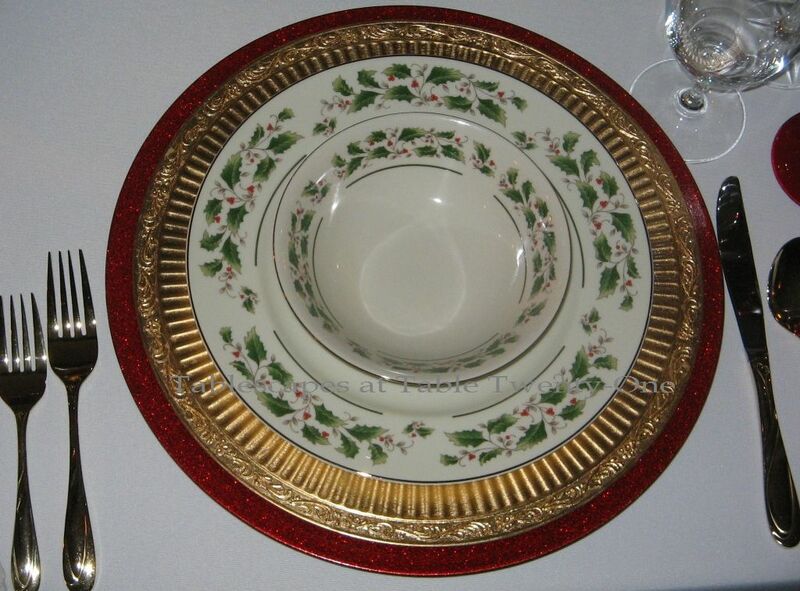 The holly china is lovely and looks especially festive with the red and gold chargers. Everything looks wonderful together. You created a beautiful tablescape for a memorable wedding shower! Take a bow and get your chill on! Beautiful work. 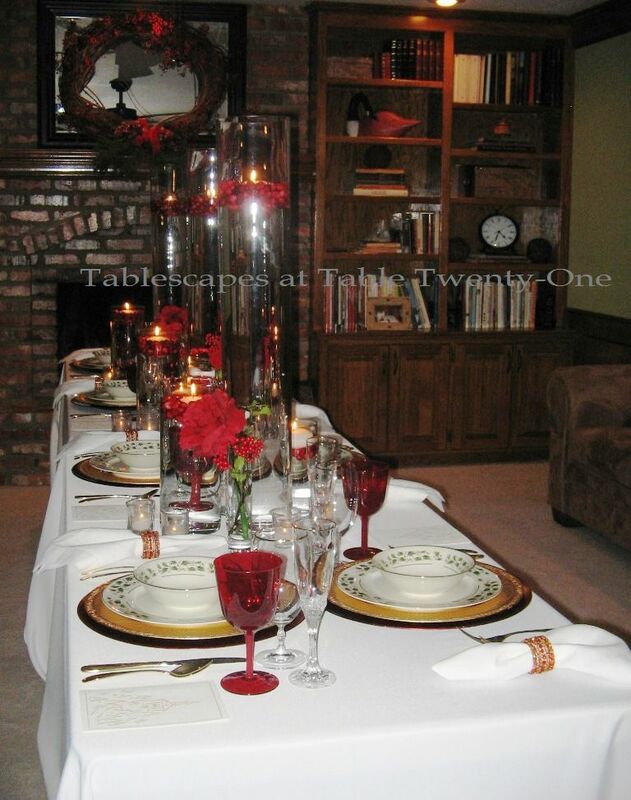 Lovely Tablescape and the Right Spirit. What a lucky bride, to have you host her shower, because if anybody can give a beautiful shower it would be YOU!! I can’t believe you found that PERFECT card, and that you thought to use it for the menu! Beautiful again, Alycia!! Merry Christmas to you and Ramon from our home. Oh girlfriend, you and hubby are just too cute for words! p.s. I still owe you an update, just keep forgetting to do so.. look for it, it will be a long note. What a gorgeous shower table Alycia! I love the height and drama of your cylinders with the cranberries~ Beautiful! You are SO photogenic…Merry Christmas! 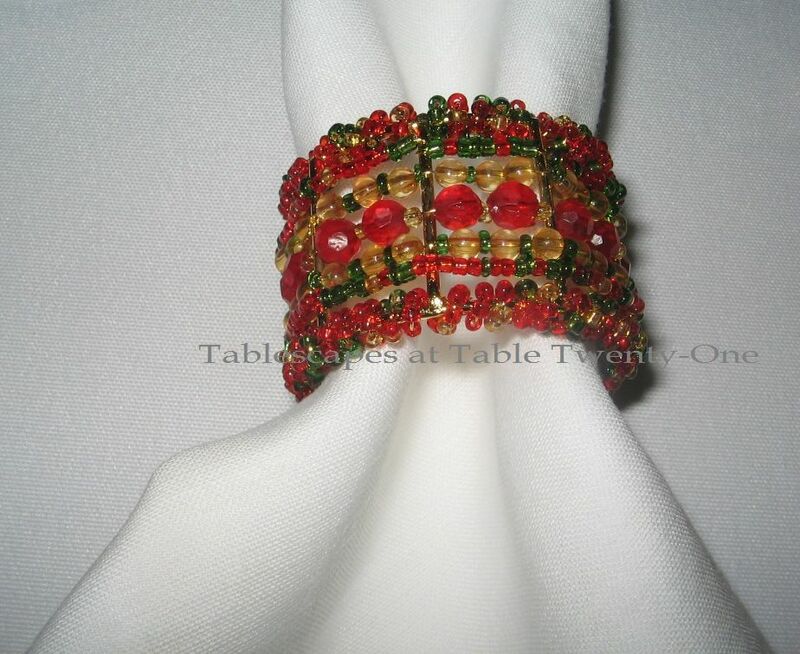 Beautiful table…love thoser 99¢ napkin rings! Alycia, you have a beautiful family…Merry Christmas to you and yours. 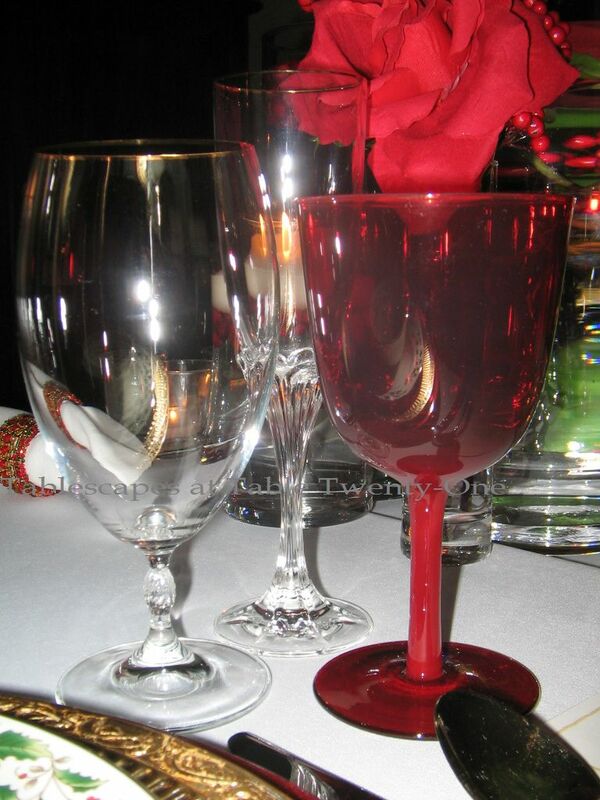 I love Christmas weddings … and I love LOVE when things come together! Beautiful tablescape, Alycia. Merry Christmas to you and yours — and best wishes to the bride and groom! Beautiful table!! I love your dishes (my Christmas dishes are similar) but your monogrammed napkins are gorgeous!!! Merry Christmas to you and your family! Another gorgeous table, Alycia! The cylinders are stunning! 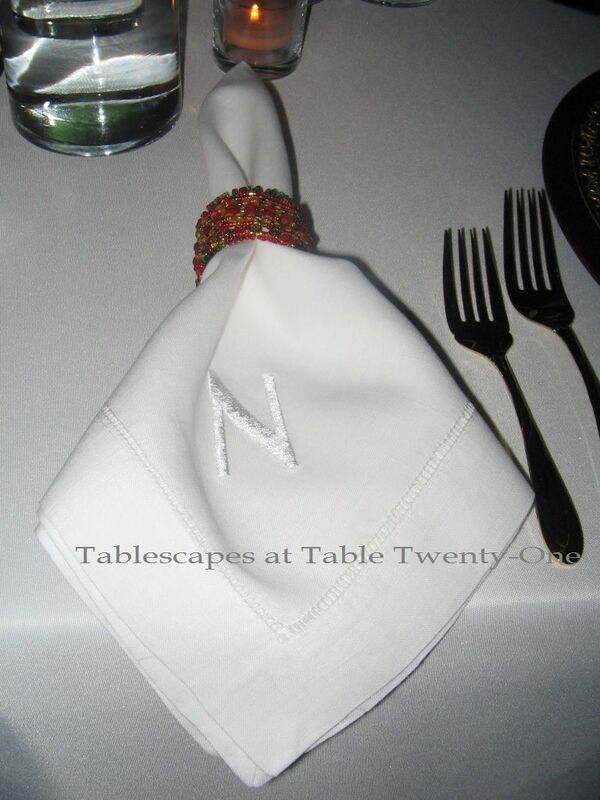 And I love the beautiful simplicity of those fabulous monogrammed linen napkins! Well, Alycia, another very dramatic centerpiece! I love how the size is big, but the clear glass allows the eye to take in the whole table. Your dishes are so pretty, and I love the double chargers. Lovely photos of you and your honey, and how wonderful you have your parents close by! Have a wonderful holiday, my dear! Your table is beautiful Alycia. I love the simplicity and elegance. Great job! Hope everyone will have a Peaceful Christmas. What a beautiful festive setting! and I guess great minds think alike: we both had tall cylinders of water at the center… yours look great topped with the berries and candles! Wishing you and your family the merriest and warmest of Christmas holidays and a happy, healthy New Year! Dear Alycia, the table is stunning, and I am certain the bride felt much love to have had such an amazing setting to kick off her wedding festivities. I too am in love with the way you use those tall cylinders…they are stunning, no matter how you chose to use them! I think honestly you could take paper plates and make them look beautiful…I am certain of it! I hope you and your family have a special and blessed Christmas. Thank you so much for being such a blessing to me! Your table is just beautiful! Love those tall cylinders with the cranberries! 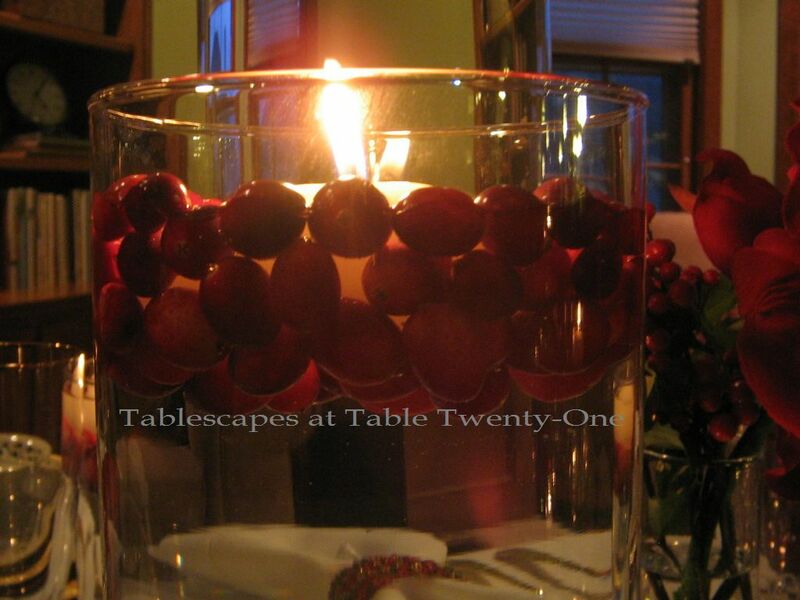 (Note to self…go buy cranberries…very cool to decorate with). Love how you layered the red and the gold chargers. Very dramatic touch! I like drama, well where dishes are concerned. I love all of your holiday decor, too. Everything looks so festive and ready for a visit from Santa! Hope you and your family have a very Merry Christmas and I look forward to seeing more of your fabulous tablescapes in the New Year. Your table is so pretty. Yes, a fun way to have a shower and have it so pretty. 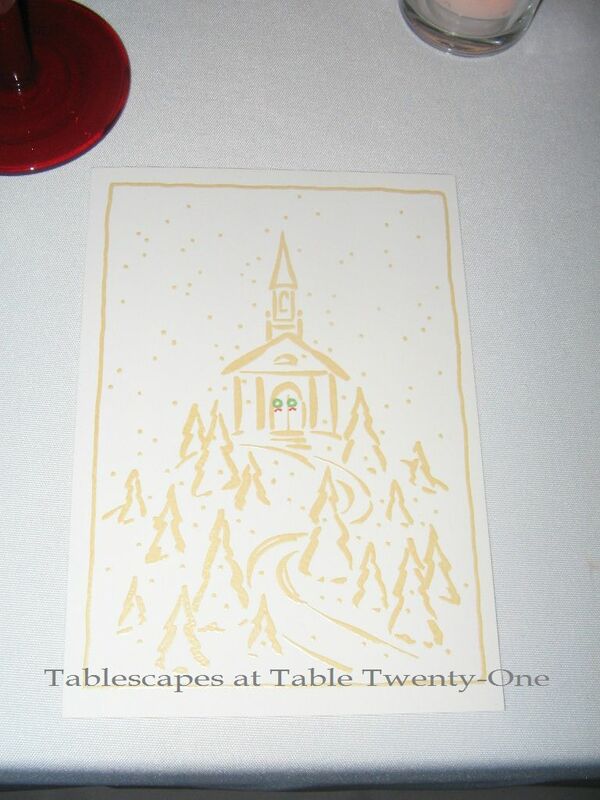 I love your idea of using a stock Christmas card for the menu. You always do such a nice job on your menus. Everything looks so pretty by candlelight. I love your cute photo with your hubby (best helper) and your friend. Have a joyous Christmas! I know it will be beautiful! You and your family are AWESOME! AND, your table looks fabulous. I love when I see your name on my comment list- you are always so kind and supportive! Wow! Just love the layering of the chargers and plates. The centerpieces are…just wow beautiful! I wish you a ver Merry Christmas! p.s. LOVE the pics of you and hubby, and your friend and sweet parents! Thank you for the wonderful compliment on my table over at 21 Rosemary Lane. Wow and now that I see what you can do I am truly flattered! It also seems that the number 21 has some significance to both of us. Please stop by again as I will here. Thanks so much for your kind wishes Alycia!! Yes, it has been very painful. I have been hobbling around trying to decorate tables, wrap presents etc and finally have things finished. I can’t wait to get to the beach house tomorrow for a few weeks rest. Have a wonderful Christmas and I will catch up with you next year!!!! As always, your table is lovely, but what I like best is knowing that it will be filled with laughter and cheer. Yours is such a good spirit that always brightens my day. Hugs! Your decorations are SO pretty!!!! Each and every one of your pictures put a smile on my face! Thank you for posting such wonderful and happy pictures!!!! Merry Christmas to you and many blessings!!!!! Such a pretty table! Love the double charger idea- wish we had Old Time Pottery stores here. And the cylinders with berries and candles are gorgeous.